This page was enrolled in the International Ophthalmologists contest. Assigned status Not reviewed on October 21, 2016. Laser therapy has been used to treat many pathologies in the eye for decades. A xenon arc laser was developed in the 1950s by the Carl Zeiss Laboratory and was used clinically in the early days of retinal therapy. 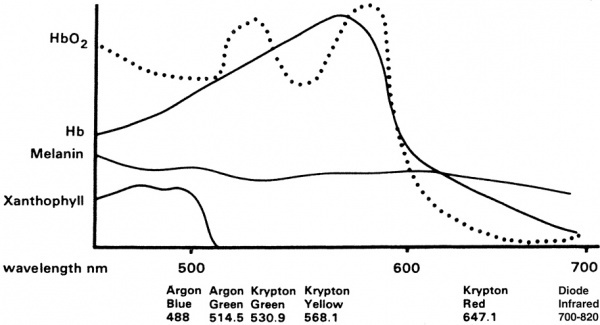 The argon laser was discovered in 1964 by William Bridges. However, an official study to investigate the effects of laser treatment via PRP was not conducted until the 1970s. This study, the Diabetic Retinopathy Study (DRS) examined the effects of pan-retinal photocoagulation through both xenon arc laser and argon laser treatments on patients with proliferative diabetic retinopathy (PDR), to determine whether it was more beneficial than no treatment at all. The study showed that that laser therapy was indeed beneficial to patients with PDR and also showed that argon lasers created less adverse effects for patients than xenon did while retaining similar efficacy. This study also set forth the first clear treatment parameters for PDR. As a result, xenon arc laser therapy is now largely discontinued, in favor of argon laser (or modern equivalent continuous wave milisecond laser systems). The Early Treatment Diabetic Retinopathy Study (ETDRS), conducted shortly after the DRS, examined the effects of PRP on patients with non-proliferative diabetic retinopathy (NPDR), and determined the exact stage in the disease course at which laser therapy should be administered. Currently, more advanced laser delivery systems and other methods of combating diabetic retinopathy are emerging. However PRP remains the mainstay of treatment. Light from the laser is absorbed by the retinal pigment epithelium (RPE), which overlays the choroid, just below the retina. The retinal pigments in the RPE serve to absorb nearly all wavelengths of light. For PRP, typically yellow, green, or red laser light is used. Laser energy is absorbed is converted to thermal energy, raising the tissue temperature approximately 20 or 30 degrees Celsius. This denatures tissue protein via thermal burns, which leads to local retinal cell death and coagulative necrosis. Over time, these areas of thermally damaged tissue eventually scar and become more heavily pigmented, leaving visible laser scars at the level of the RPE. Classically, approximately 1000-2000 micro-burns are made on the retina. By destroying the largely unused, ischemic extramacular retina, PRP reduces the area of ischemic tissue, which in turn reduces total vascular endothelial growth factor (VEGF) production in the eye and thereby reducing the impetus for neovascularization. PRP is typically delivered through either a slit lamp system or laser indirect ophthalmoscope (headlamp/BIO). Slit lamp: The laser is attached to the typical ophthalmic slit lamp and the laser energy is delivered in a coaxial fashion. The patient is placed in a seated position, and the chin placed on the chin-rest. A contact lens, which focuses the laser onto the retina, is placed against the cornea with clear coupling agent. Typically a wide angle or mirrored lens is used. The laser is then fired transcorneally through this contact lens, focused on the retina. Headlamp: The patient may be supine or seated. The doctor wears the typical indirect headlamp with the laser attached coaxially. A hand held lens is used to view the retina and focus the laser on the retina. The doctor's head movements control the aim. In both cases, the doctor or surgeon will place topical anesthesia, usually proparacaine or tetracaine, into both eyes. For infants or patients with compliance problems, stronger anesthesia such as systemic anesthesia or seditive may be administered. Both methods make approximately 1500-5000 typical-sized burns across 1-4 treatment sessions (variable with treatment protocol). According to DRS protocol using a standard argon-type laser PRP, settings include burns that range approximately 200μ to 500μ in size, pulse durations of 100 miliseconds, and 200-250 mW of power behind each fire of the laser. The goal is to produce burns that are grey in color; avoid white burns. Depending on the protocol being used, all settings may be adjusted for the desired effect. PRP is indicated to treat retinal ischemia and retinal neovascularization, from whatever cause. However, PRP is most commonly used for diabetic retinopathy. The DRS, conducted in the 1970s by the National Eye Institute, was a landmark randomized and controlled study examining whether PRP was an effective means of halting the progression of proliferative diabetic retinopathy and preventing vision loss, in comparison to no treatment. The DRS was conducted in fifteen medical centers across the United States, and enrolled over 1700 patients. Patients were required to have severe NPDR in both eyes or PDR in at least one eye. Each patient received PRP treatment in one eye, while the other eye served as a control. Patients were randomly assigned to either xenon arc treatment or argon treatment. The study found that patients who received PRP had significantly better results than those who received no treatment. PRP reduced the risk of severe visual loss (SVL) by more than 50%. Untreated eyes had a vision loss rate of 16.3%, whereas treated eyes only had a vision loss rate of 6.4% over two years. Eyes with high-risk PDR and high-risk characteristics (HRC) received the greatest benefits. Furthermore, the DRS examined the efficacy of xenon arc laser treatment versus argon laser treatment. The study showed that argon laser was the better option. Xenon arc laser treatment is now largely discontinued. While the DRS demonstrated that PRP was more effective at combatting PDR than no treatment, it did not determine when, in the course of the disease, PRP should be administered to receive the greatest benefit. The Early Treatment Diabetic Retinopathy Study (ETDRS) attempted to examine whether early PRP was more effective than deferred PRP treatment. It followed the photocoagulation guidelines set by the previous DRS study. The DRS study showed that at 2 years, 11% of treated eyes and 26% of control eyes with high-risk retinopathy developed severe visual loss and that at 4 years 20% of treated eyes and 44% of control eyes developed severe visual loss (worse than 5/200). For early proliferative retinopathy- 3% of treated eyes and 7% of untreated eyes developed severe visual loss at 2 years and at 4 years 7% of treated eyes and 21% of untreated eyes developed severe visual loss. The DRS cautioned against treating patients with early-proliferative retinopathy and lesser levels of retinopathy because of the risk of laser itself. As such, the ETDRS study group advised that scatter photocoagulation not be initiated in mild cases of NPDR, in order to balance the potential adverse effects and relative risks of treatment against the minimal benefits gained by treatment at early stages. PRP is to be initiated when NPDR becomes severe or progresses into PDR. Long-Duration PRP treatment is the oldest and most conventional form of PRP, and was initially investigated by the DRS. The DRS set certain guidelines for its administration; however, some aspects are slightly outdated. Long-duration PRP is associated with the highest levels of patient discomfort, as burns must be delivered individually and the procedure duration is relatively long. Conventional PRP usually consists of pulse durations of 100 milliseconds, large spot size (200-500μ), with 200-250 mW of power applied. Typically utilizing pattern Scanning, this protocol delivers a pattern of multiple burns in the same or less amount of time that conventional lasers take to deliver one burn. The speed of delivery allows newer lasers to reduced the pulse duration to 10-30 milliseconds per spot, which is balanced by many more total spots (often 3000-5000). Short duration laser provides patients with more comfort than long-duration PRP does. Navigated PRP (nPRP) works by tracking retinal eye movements in real time using the assistance of computers. The computer and laser automatically readjust in accordance with the movement of the eyes. Imaging techniques for nPRP include infrared, color, and fluorescence angiographies of the fundus, which minimizes the amount of light that patients are exposed to. Navigated PRP can be either single-spot or pattern-spot arrays that reach all the way to the peripheral retina. It can be short or long duration. Navigated PRP may have a higher accuracy than conventional PRP techniques, although accuracy is not critical for PRP treatments. The scars that nPRP leaves behind are also more uniform and consistent than those delivered by manually guided lasers. Navigated PRP does not use a contact lens with current machines, due to the various imaging processes involved. Sub-Threshold Diode Micropulse (SDM) laser was originally targeted towards combatting diabetic macular edema (DME). Since diabetic retinopathy affects all parts of the retina in the same way, SDM has recently been hypothesized to also counter PDR. At this point, peripheral SDM instead of PRP is considered experimental. Patients will experience varying levels of discomfort based on the type and duration of PRP received. During the procedure, patients will often experience a small “pinching” sensation with each burn created in the affected eye. For this reason, PRP may be divided into several sessions. If the contact lens is irritating the patient’s eye, anesthesia can be administered; however, patients will not be able to see for up to three to four hours until the anesthesia wears off. After the procedure, it is normal for patients to have mild headaches; a tylenol or other such analgesic is appropriate for managing pain. Patients may often experience some permanent decreases in peripheral, color, and night vision, although this is lessened with various protocols. Patients who experience unusual symptoms after PRP, such as an increase in flashes, floaters, pain, redness, a significant decrease in vision, or the sensation that their field of vision is obscured by black curtain, should call their surgeon immediately. Choroidal effusion is a fairly uncommon side effect, which can cause worsening of vision temporarily. Typically, no medications after PRP treatment are indicated. Some doctors may choose to supplement PRP treatment with anti-VEGF hormones. Patients can resume all normal activity immediately after receiving PRP. Anti-vascular endothelial growth factor (VEGF) medications are an emerging treatment alternative and supplement to PRP. Anti-VEGF treatments are associated with less loss to the peripheral vision, and less occurrence of central-involved diabetic macular edema. They are thus considered a safer route than PRP for those patients with diabetic macular edema (PRP can worsen the status of patients with severe NPDR/PDR and DME). Currently there are four anti-VEGF agents available: bevazicumab, ranibizumab, pegaptanib, and aflibercept. All of these agents are believed to be approximately equal in efficacy in DR. Injections alone are an emerging treatment. Protocol S was a well designed randomized clinical trial showing ranibizumab is similar in efficacy to PRP. There are questions about follow up and long term, real world outcomes in the diabetic population. Kozak I, Luttrull JK. Modern retinal laser therapy. Saudi Journal of Ophthalmology. 2015;29(2):137-146. doi:10.1016/j.sjopt.2014.09.001. Abu El-Asrar AM. Evolving Strategies in the Management of Diabetic Retinopathy. Middle East African Journal of Ophthalmology. 2013;20(4):273-282. doi:10.4103/0974-9233.119993. Evans JR, Michelessi M, Virgili G. Laser photocoagulation for proliferative diabetic retinopathy.Cochrane Database of Systematic Reviews 2014, Issue 11. Art. No. : CD011234. DOI: 10.1002/14651858.CD011234.pub2. This page was last modified on November 20, 2018, at 12:49. This page has been accessed 68,968 times.